Amount of product: Flexible pouches packaging has a shockingly high liquid carrying capacity, especially in comparison with other shipping materials. It requires just 1.5 pounds of flexible plastic to deliver up to 10 gallons of liquid. To put this into perspective, you would need at least three pounds of aluminum to move the same amount of product, such as juice, soda, or water. With less packaging needed, less is spent on packaging, allowing companies to spend that money elsewhere. Shipping space: Other transportation receptacles, such as boxes or glass jars, take up a lot of space; much of which could be empty space either between packages or inside of them. In order to transport the same amount of glass jars and flexible pouches packaging, you would need 26 truckloads and one truckload respectively. As you can probably imagine, the difference paying for another 25 trucks can make is pretty substantial, considering you're not only paying for the space but but for the truck drivers as well. Durability: It's not at all uncommon for some parcels to be damaged during shipping, which usually means the loss of whatever contents are inside. However, flexible packaging designs were made to be malleable in order to better absorb impact. And because flexible pouches packaging is mainly used to deliver liquids, there is no risk of the contents being damaged without a sturdy outer covering to protect them. Overtime, even minor product losses can lead to a large amount of unnecessary expenses. One of the staples of improving a business is to make operations more cost-efficient. 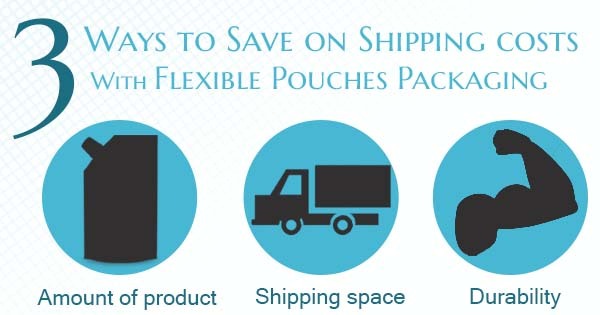 Considering most companies wouldn't survive without being able to ship their products, reducing transportation costs could amount to enormous savings.